The Australian dollar has remained in focus for our scalp trades over the past few weeks and so I thought it appropriate to offer an update on the current progression of the setup. Also of interest is the current positioning of the AUDCAD which has traded into a key near-term inflection point at 1.0455. The AUDUSD rejection at 1.0440 noted in last week's report proved advantageous for our initial bearish scalp bias and the aussie declined into support target 3 at 1.0365 before reversing course higher. With price action respecting our bottom limit at 1.0335, we adopted a bullish intra-day bias with a breach back above the 1.04-handle. The pair is once again testing pivotal near-term resistance at the 61.8% retracement taken from the September decline at 1.0445. A rejection of this level puts our downside targets back in play while a breach above this mark targets the near confluence of the R1 monthly pivot and monthly highs at 1.0480, and the 100% extension off the October lows at the 1.05-handle. Note that daily RSI now looks poised for a test of the 60-mark, with a breach offering further conviction on long-side bias scalps. The scalp chart shows the aussie breaching trendline resistance dating back to the monthly highs with the exchange rate currently sitting just above the 78.6% Fibonacci extension at 1.0440. "Note that this level confluences with the key 61.8% retracement taken from the decent off the September highs (as seen on the daily chart) and is likely to offer strong resistance for the pair." A close above this mark risks advances to 1.0470 with a breach above the monthly highs eyeing targets at the 100% extension at 1.0495, 1.0520 and the 123.6% extension at 1.0550. If the AUDUSD fails to close above this mark yet again, look for RSI to trigger shorts targeting 1.0420, the 61.8% extension at 1.0396 and 1.0365. 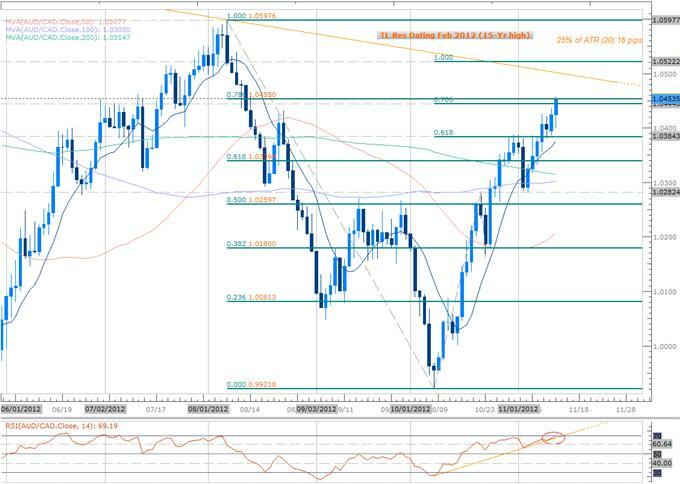 Again we note that a key break below our bottom limit at convergence of the 38.2% extension at 1.0335 risks substantial declines for the aussie with targets seen lower at the monthly pivot at 1.0313 and the 23.6% extension at 1.0296. The daily average true range has tightened to 63 pips and so yields profit targets of 16-18 pips per scalp depending on entry. Should ATRcontinue to pullback, adjust profit targets as need to ensure more feasible scalps. *We will remain flexible with our bias with a breach above 1.0480 eyeing subsequent resistance targets. 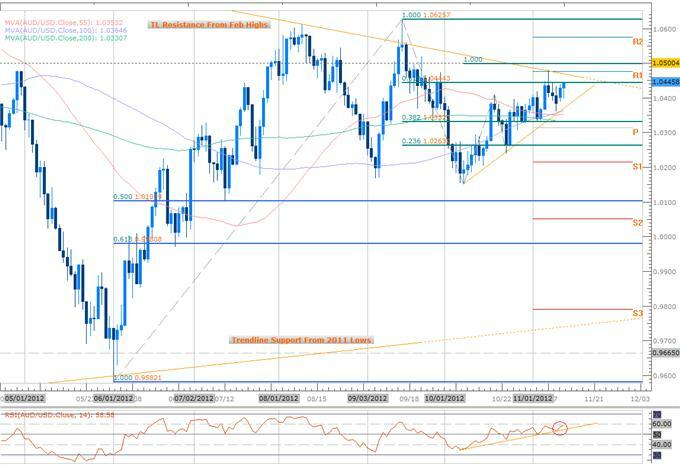 A look at the encompassing structure sees the AUDCAD approaching trendline resistance dating back to the February 15-year highs at 1.0783 with the pair rallying an impressive 5.3% off the September lows. 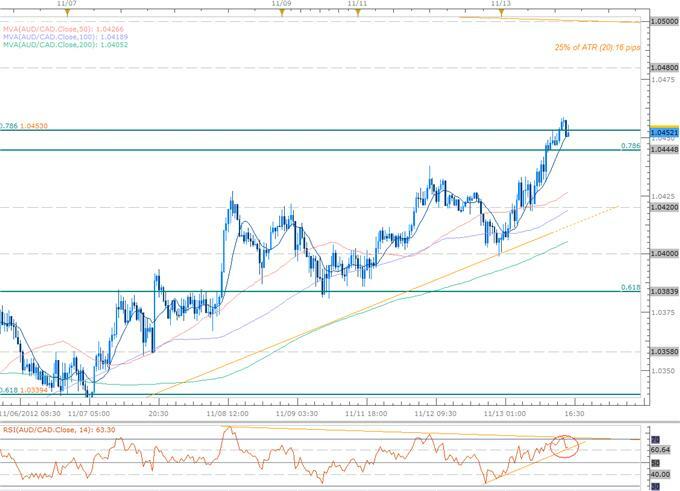 The exchange rate has now reached a pivotal inflection point at the confluence of the 78.6% retracement taken from the August decline and the June highs at 1.0455. While it is too pre-mature to call this a high, we note that daily RSI has now advanced right into the 70-overbought threshold and a reaction at this level is likely. 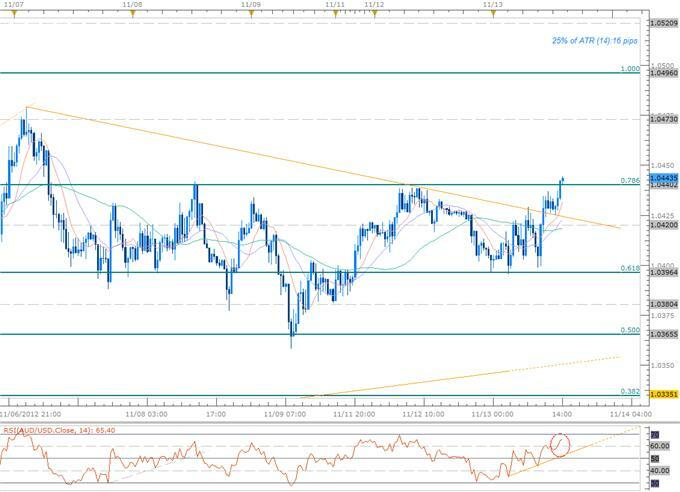 A break of RSI trendline support may trigger a near-term correction with a move below the 78.6% Fibonacci extension taken from the October 8th and 23rd lows at 1.0445 targeting the 61.8% extension at 1.0385. A topside break above 1.0460 coupled with a breach of the 70-threshold in RSI targets trendline resistance (currently around the 1.05-handle) and the 100% Extension at 1.0520. The 30min scalp chart shows near-term failure to hold above key resistance at the 1.0455-threshold with a break back below the 78.6% extension at 1.0445 targeting 1.0420, the 1.04-handle and the 61.8% extension at 1.0383. A break below this level offers further conviction to our downside bias with such a scenario eyeing targets at 1.0360 and the 61.8% retracement at 1.0340. Note that an RSI break below near-term trendline support could trigger the correction below 1.0445, thereby putting our short-scalps into play. Current positioning puts this setup just below our topside limit at 1.0455 with a triggered break above eyeing targets at 1.0480, the 1.05-figure and the 100% extension at 1.0520. A daily average true range of 63 pips yields profit targets of 16-18 pips per scalp depending on entry. Should ATRcontinue to pullback, adjust profit targets as need to ensure more feasible scalps. *We will remain flexible with our bias with a breach above 1.0460 eyeing subsequent resistance targets.It’s extremely important in these market conditions to give added consideration regarding the timing of intra-day scalps with the opening ranges on a session & hourly basis offering further clarity on intra-day biases.